Cycling Without Age brings people together. Photo: Municipality of Odense. The Danish organisation, Cycling Without Age, launches new international campaign to spread the succesful concept to the rest of the world. Now, you too can be part of this magnificent movement. Cycling Without Age now offers royalty-free licenses to everyone who wants to give their local elderly citizens the right to wind in their hair. It’s something everybody can do. The licenses have become so popular that Ole, Dorthe and the rest of the team have just launched a campaign to raise money for these special rickshaws and know-how to be shipped to passionate license-holders around the world. Visit the campaign here: https://www.indiegogo.com/projects/cycling-without-age-bikes-for-the-world. In countries where cycling is not mainstream Cycling Without Age can thus help put a friendly face on cycling as a way to build human scale, liveable cities. Want to support the campaign? Click here. Getting outside, feeling the wind in your hair and sharing stories is what it is all about. Many elderly people are forced to spend a lot of time indoors, and socializing can be a limited joy. Cycling Without Age is a movement that seeks to give elderly people a better life through life-affirming experiences shared with others. The idea was formed by Ole Kassow back in 2012. He thought that it would be great to let elderly people experience their old neighborhood in a quiet pace with plenty of time for anecdotes. So one day he borrowed a rickshaw, showed up at a local nursing home and asked the staff if anyone would like a ride. Soon after an elderly lady named Gertrud and a member of staff came out and took a seat in the rickshaw and the first ride began. The ride not only gave Gertrud a chance to go down memory lane, it also created an instant bond between Ole and his two passengers, as soon as Gertrud started telling stories about places she would remember from back in her youth. She explained to her astounded co-riders that the smells, sounds and sights brought back long-forgotten memories. After the trip Ole rode home in a lifted spirit with a feeling that he had discovered something remarkable. Rumors about this fantastic first trip quickly spread throughout the nursing home, and it didn’t take long before the demand for trips where higher than Ole could manage on his own. Luckily the rumors had also spread outside the nursing home, so Ole got a call from an employee from the municipality who wanted to invest in 5 rickshaws and place them on different nursing homes. That’s how Cycling Without Age was born. With that phone call the project caught pace and Ole started organizing a team of volunteers and persuaded other municipalities all around Denmark to buy rickshaws. Today around half the municipalities in Denmark are part of the movement and many others are interested. There are now over 2,000 volunteers (called pilots) in Denmark and Norway, doing hundreds of rides every day. The positive response from around the country can attributed to the fact that the initiative addresses many important societal challenges. It helps alleviate the number one problem for the elderly: loneliness – by getting them out of their homes or nursing homes and linked up with other generations. 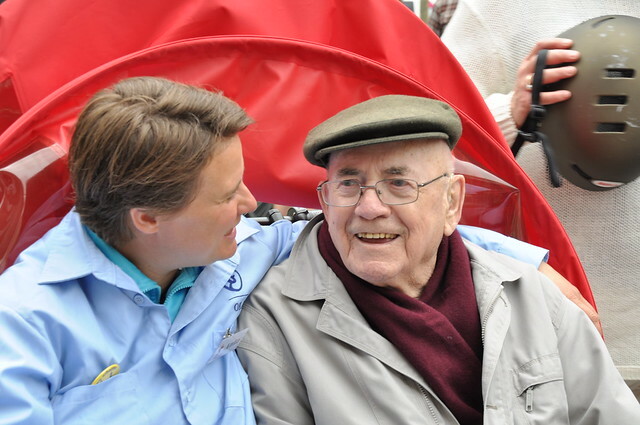 A sense of belonging and companionship are critical for a person’s mental well-being, and so Cycling Without Age helps increase the quality of life among the elderly – and the volunteer pilots experience a dopamine rush by their acts of kindness and compassion. Since people around the world are more or less the same, soon other countries wanted to adopt the concept. 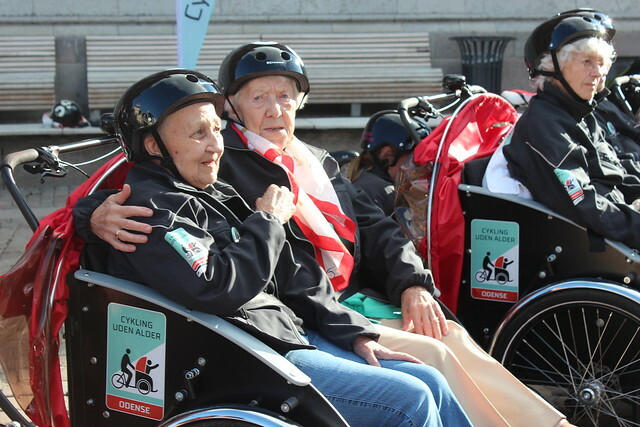 Today Cycling Without Age, now an official non-profit organization, is represented in 14 countries around the world, from Singapore to the United States and Argentina. Especially European countries are keen to adopt the idea, with Norway now approaching more than 100 rickshaw locations.